“Thank you Valvoline for recognizing Road To Recovery drivers. This is a program near to my heart, and it is great to see such a trusted brand helping this holiday season,” says Stephanie Deagle, an 8-year veteran of this program. Over 80 Southern California Valvoline Instant Oil Change (VIOC) service centers helped fundraise $20,840 benefiting the American Cancer Society’s Road To Recovery Program, which provides free rides to patients who otherwise might miss their potentially life-saving cancer treatment. 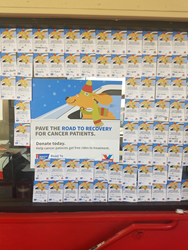 Donors saw their contribution cards pasted up, creating ‘Walls of Generosity’ at all SoCal VIOC locations. The campaign was part of the American Cancer Society and VIOC’s growing partnership. VIOC has donated free oil changes to Road To Recovery drivers and has committed to raising funds for this critical program helping patients in need. In a wonderful grassroots response, the majority of funds were donated by Valvoline customers, who could opt to donate $1 to $5 to support the Society’s transportation program. Road To Recovery drivers are volunteers who use their own cars to take cancer patients to and from treatment. Each year, hundreds of rides are provided in Southern California. “We are excited about the opportunity to build a partnership with the American Cancer Society. It is a wonderful organization who is on the front lines fighting cancer, both locally and nationally,” says William Smelley, vice president of Marketing for the VIOC franchisee.